Simple and inexpensive projects around the house can sometimes make the biggest impact. For example, this little project gave us a nice bump in our curb appeal, but only cost a few dollars! 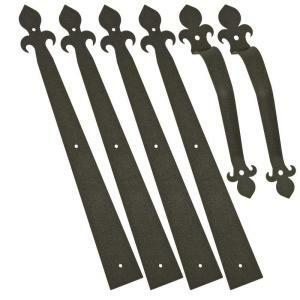 The other day, I was walking through Home Depot and saw a package of decorative garage door hardware for less than $4! I actually double checked with the front desk that it was the correct price before getting too excited about it. But that was the right price, so into the cart it went. Anyway, I brought them home, and they sat in my garage – until yesterday. I had been trolling through pictures online and found many examples of carriage garage doors and I love the look, but not the price. However, lucky for me, it was easy to re-create using a little paint and this hardware. Here is my garage yesterday morning. Blah, but it works fine, so there is no need to replace it. Before I started, I made sure to clean the door where I would be painting. Then, I measured the height and width of the raised panels, and marked off the center of each and applied painter’s tape to make the cross section. I started painting without marking off the outside, figuring I could stay on the raised section of the tile – but I was wrong. So I quickly wiped off my mistake, and used some Frog tape to mark off the outside of each pane. I primed each section using exterior primer, tinted to grey. 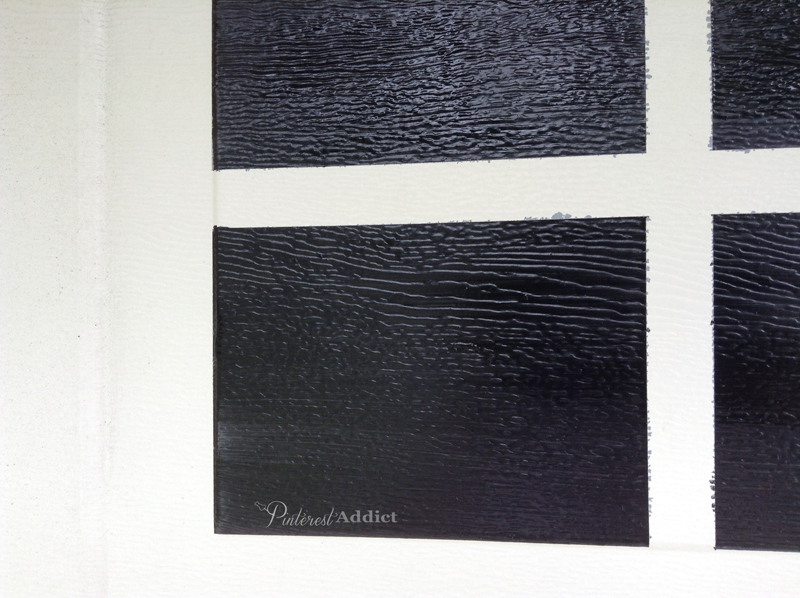 Then followed up with Sherwin Williams All Surface Enamel in Satin Finish- Tricorn Black – interior/exterior paint. This paint is water based and doesn’t have much of a smell to it, unlike the oil based paint. I’ve used it all around my house and I love it! Super durable and goes on like butter. When it was all done, I pulled off the tape to reveal my new “windows”. Pretty, huh? Let me just note here that I used two different kinds of painters tape, the blue stuff for the inside lines, and Frog tape (green) for the outside lines. This is a close up of one of the “panes of glass” – which one do you think did a better job? 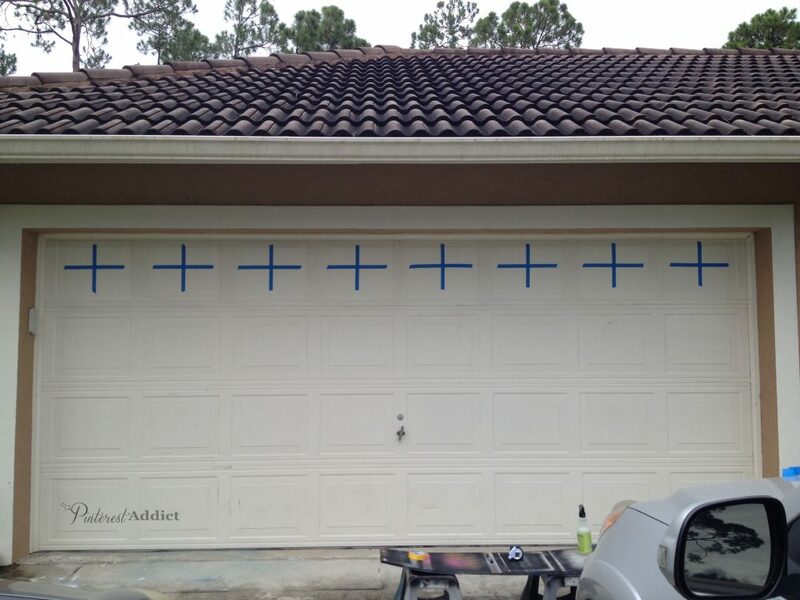 Scotch Blue vs. Frog Tape – in this case, the Frog tape did a much better job of keeping the paint from seeping through. I never really had a preference before, because I assumed that they were pretty much the same, but after this experience, I can plainly see that the Frog tape made a cleaner line, and didn’t pull off the paint that was already there. So, guess which one I’ll be buying in the future? My husband installed the hardware, and I gave it a good cleaning this morning, and wha-lah – we have a (faux) Carriage Garage Door! the view from down the driveway. I figure that since I already had primer and paint, and painter’s tape, the only thing I had to purchase was the hardware and it cost me less than $4 with tax! Since I know you don’t want to have to scroll up to see the before, here’s a before and after for you. I love the little bit of character that it gives to the garage. I love that it only cost me a hour or so of time and $4 even more!! I’m off to give all the doors inside the house a second and third coat of black paint. Can’t wait to share how they turned out with you! **Pinterest Addict is a participant in the Amazon Services LLC Associates Program, an affiliate advertising program designed to provide a means for sites to earn advertising fees by advertising and linking to amazon.com. Thanks for posting I have been wanting to do this for a while. I will be heading to HD today to see if I find the same deal you got for the hardware. Your project looks great!!! Thanks! I saw a few more at our HD two days ago – good luck at yours!! Thanks soo much for posting this,it saved me money to purchase either a clip on faux window or the adhesive ones. My neighbors mouths dropped open as I confessed it was painted on and I loved it,too!! WOW!!!! Your garage looks amazing! I am going to have to try it too! I LOVE your garage door!!!! Thank you so much for the tutorial. I am definitely going to do this to my garage door. I’m going to stop at HD on my way home and see if they have the hardware in stock. 🙂 Me thinks this will be a great weekend project this weekend. I love it! What a great idea. Thanks for sharing. This is a great project. What a great idea!! 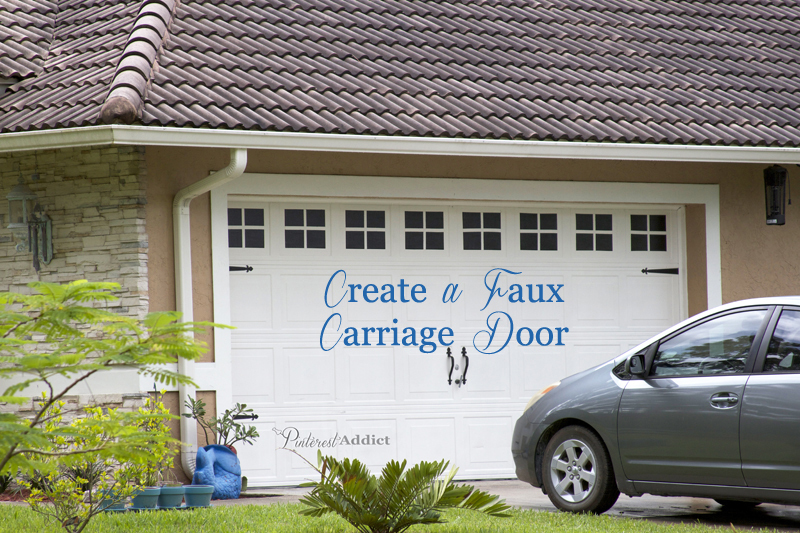 I love the look of carriage doors, and this is so much cheaper than buying a new door. Isn’t Frog tape is amazing! I picked up 3 free rolls at Haven last year. AS always Eliesa, YOU ROCK! I never get tired of your blog-o-rama! AND, I give you permission, as one of your Peps, to take August off from blogging. and have a great summer! Oh my gosh–this looks GREAT! What an impact. Ooh, I so want to do this! We have two separate doors, though- think it will look ok? Yes! Google faux carriage garage doors, and there are a million ideas! Nice job, Eliesa! It looks very pretty. That’s a good idea – I just wish I knew what color the door was – and the rest of the trim on the house. I’ll have to see if I can get it color matched. It’s kind of ivory white. I just added this hardware to my garage and then my shed – both posts here (http://piersandchandeliers.blogspot.com/2013/06/b-garage-door.html and http://piersandchandeliers.blogspot.com/2013/07/b-shed.html) ! I read from one of your commenters about painting the silver handles white to make them disappear – so I can’t wait to do that! I also love your post on your painted bamboo hutch! I also bought a hutch from the thrift store and painted it black. I will be doing a post on it shortly! 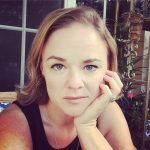 I love your blog and am about to start following! Wow! Impressive. So nice of you to share this gem! This is amazing, Eliesa! It makes such a difference! Congrats on being recognized on Home Talk for this project. Eliesa, great project and so simple…I’m trying this myself and will let you know how it goes. Also, great angle with your blog to try all those pinterest ideas! Best of luck with blogging!! Stumbled across your post via Pinterest. I found that same hardware kit at my Home Depot on clearance and we installed it a week ago. Loving the idea of painting faux windows! Clever! And amazing the difference in the tapes. I was already a Frog tape lover, but wow – it really is a lot better. Great job on the garage door. It looks really good! Glad you found my little blog 🙂 Thanks! Painting the “windows” was super easy and quick. I never thought that there was a big difference between tapes, but this proved there really is! I have some of their new chevron tape, so I’m looking for something to try it on. I’m so glad to have discovered you via Hometalk. Love this project and pinning it to my board…great creativity! I’m glad you found me too! Thank you! I love the look of this. However, is this an automatic garage door, or one you manually open? Was wondering if it would interfere with the track system of an automatic door. Thanks for any info. anyone can provide. I am wondering the same thing? I want to do this to my door and it is automatic. Will I still be able to do on my automatic garage door? I didn’t see any question on that, sorry! Will go back and look, but the answer is no. They don’t interfere at all. There are different kinds of hardware, but the ones I used in this post have little screws, so there is no interference with them. And they are placed well away from any edges of each panel. The magnetic ones don’t do anything except stick to the front of the garage door, so absolutely no interference there either. Good luck with your project! I am so inspired by this! I love carriage house garage doors but can’t justify buying new ones! I can definitely do this!! Thanks for sharing! I have the hardware already on the door, but we don’t have windows because we never wanted vandals to be able to look in our garage, so I am doing this when the weather gets nice. Thanks for the good instructions! This a fabulous! Just exactly the look I’ve always wanted at the perfect affordable price. Great how-to directions, hints & photos. Thank you! Thanks 🙂 The Frog tape worked much better. Just saw your post on painting your cabinets on Hometalk and then came here. 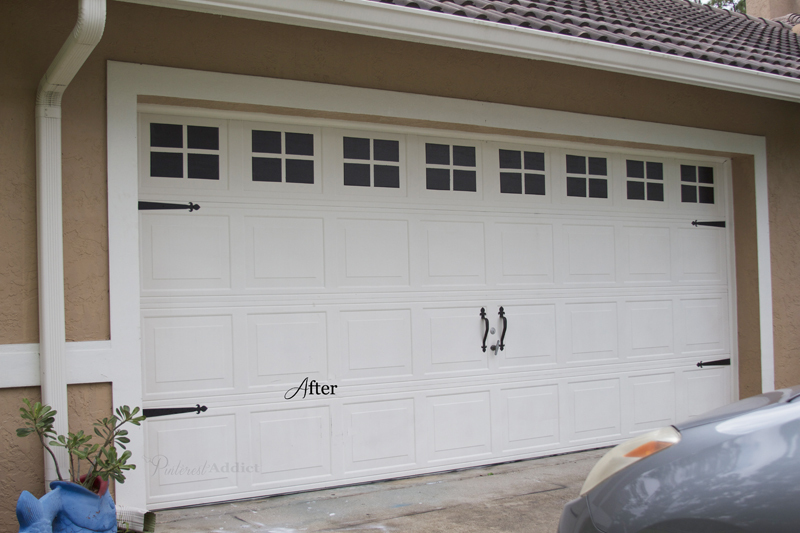 Love the garage door makeover!! Love your painted cabinets too. We are having ours done soon. Can’t wait!! Thanks for the kind words! I would love to see pics when you are done! Hi there. I did the middle seam on my door to make it look like 2 carriage doors and i used the green frog tape. The black bled like crazy when i pulled it off the door. I want to paint the windows on this summer like yours, but im so afraid of them looking horrible from the black bleeding around them. How did you seal the tape on the textured door so the frog tape doesnt bleed?? Did you use anything to press it into the texture? Looks so perfect! Great job. Hi Ty – I didn’t use anything to press it into the texture – just pressed hard on the sides of the tape. I did it for both the frog tape and the blue tape, but the frog tape worked better in this instance. 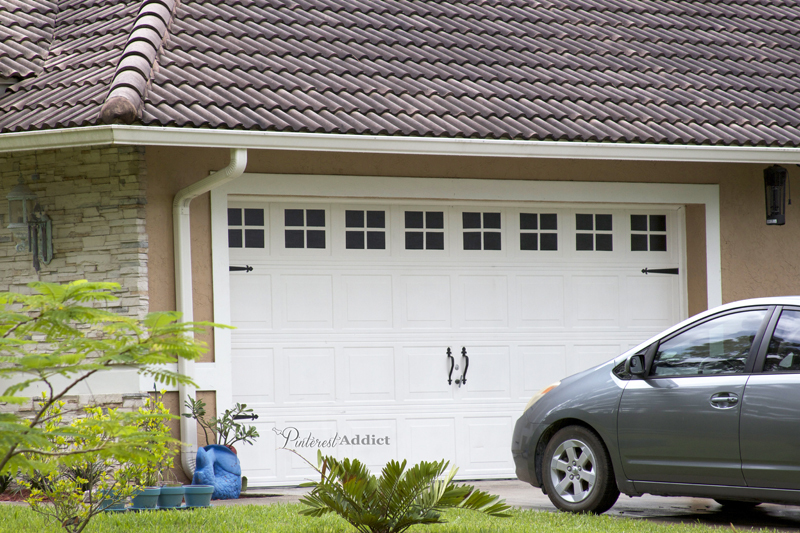 The white colored garage door look awesome. Generally we find black doors for garage. this is really exceptional and lovely and gives a classy look . Good job!! Thanks for sharing such an good post.It is very informative and best site,many people have benifit from it. This idea is pretty awesome. I am thinking, however, that I might try magnetic vent covers to stick to my garage since it is metal, instead of painting the windows on. I found the sheets at the Dollar Tree and bought about 7 packages, not knowing how I was going to use them. The magnetic side is black, the other side is white. Not sure if they would stick well enough if I put the white side against the door since I haven’t tried that yet. I could easily cut the covers into 4 pieces with scissors to make one window. Just an idea I’m kicking around. I think that’s a genius idea! Especially good if you are worried about the commitment or if you are a renter. LOVE! Let me know how it works for you if you decide to go ahead with it! FYI – If you take a little watered down white paint and lightly streak it coming out of the right or left corner of each window (in an upside down “L” shape) and lightly wipe it as you go with a wrung out wet rag the windows will look more real. It gives the impression of light reflection that real glass has. Remember to do this on the same side of each window as if the sun is hitting it there. You can also faux finish your plain doors to look like real wood, add the decorative hardware and the “faux windows”. I have been a professional faux finisher for 18 years and am asked to do this a lot. It always looks great. Great tip for the faux window streaking. Where can I get info on how to faux finish my white garage doors to look like wood? They already have a “grain” embossed in the metal panels. I don’t have any suggestions for that, but I know there are a ton of pins on Pinterest that will give you the info. Good luck! I have to thank you very much for posting this. I just did this to my garage in under 2 hours it looks absolutely awesome! Such an interesting article, its a great way to give your home a new look without breaking the bank! 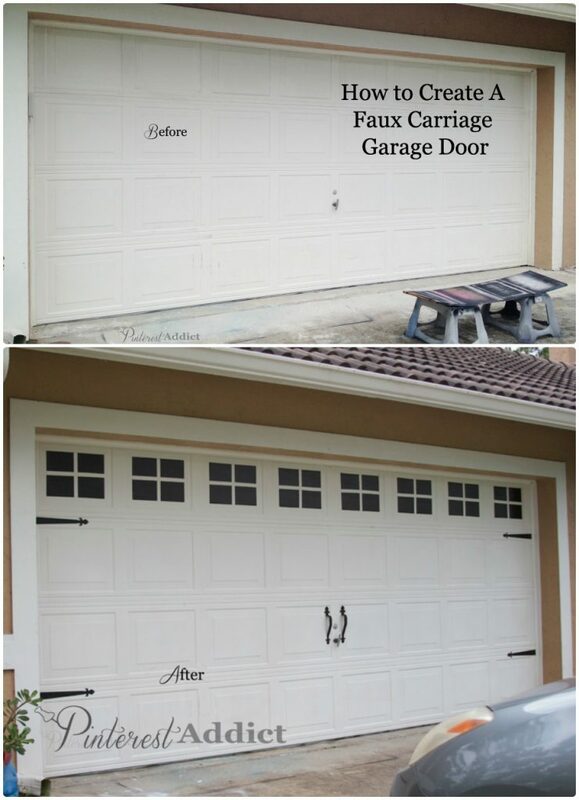 It would be interesting to see how much more you could do to give your garage door a new look! Really cool idea! The finished product is completely different than the original white door. Thanks for sharing! How wide was the tape you used? Also did you put the tape on both sides of centered lines? It’s been a while, but maybe an inch wide. I just used the two pieces of tape to make the cross shaped window panes… The door was already painted white, so I didn’t have to paint the lines. I love it. What size tape did you use? One tip I read about using painters tape is to paint the background color, in your case, white, over the tape edges first. Then paint the new color. If anything bleeds, it will be the background color, and your new color edges should be perfect! They say you should remove the tape while the paint is still wet, but that can’t happen if you’ve put down that base coat first. I’m painting my kitchen wainscoting and a few other trim areas, so I’ll be practicing what I preach. Sure hope it works! I have been told that with water-based paint, one can wait until the paint is dry before removing the tape. Supposedly, it’s only the oil-based paint that will pull up (bridge) at the tape edge if you wait until it is dry. I have found that it will pull off with either kind. It’s kind of a bummer. But if it does dry before I can remove the tape, I run a razor lightly down the seam to have it come off smoothly. Wow, this is SUCH a great idea, would never have thought to just paint the windows on! Fabulous! there are also magnetic and self stick decals for the windows and hardware for sale on ebay, etc. The faux windows look AWESOME! All the pics I’ve seen elsewhere are of white or cream color doors. 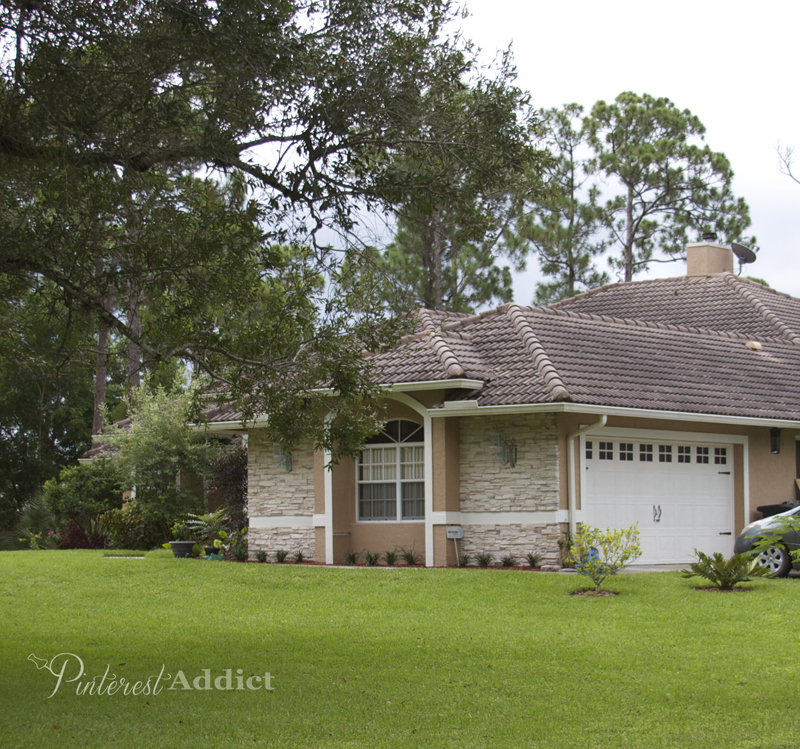 We are going to paint our currently cream-colored garage doors moss/sage green. 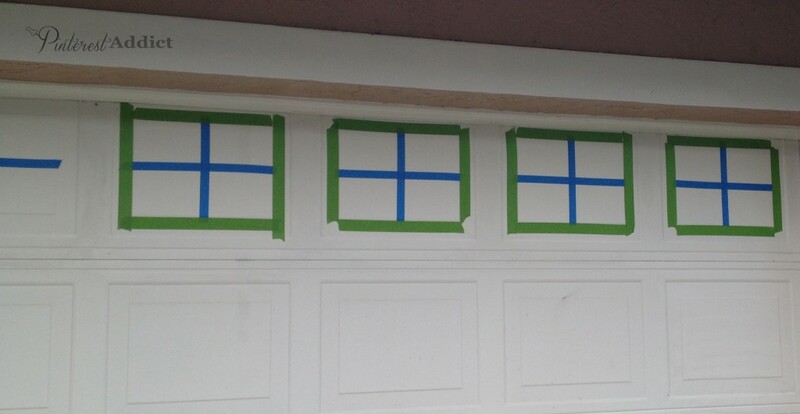 If we paint the faux windows, do you think it will look OK if the cross joints of the “windows” are green–or should they be left cream-colored? Thanks!! I think you can just leave them green. I looked up pics of real carriage doors, and the cross sections are the same color as the door. Congrats on a post going strong after four years. 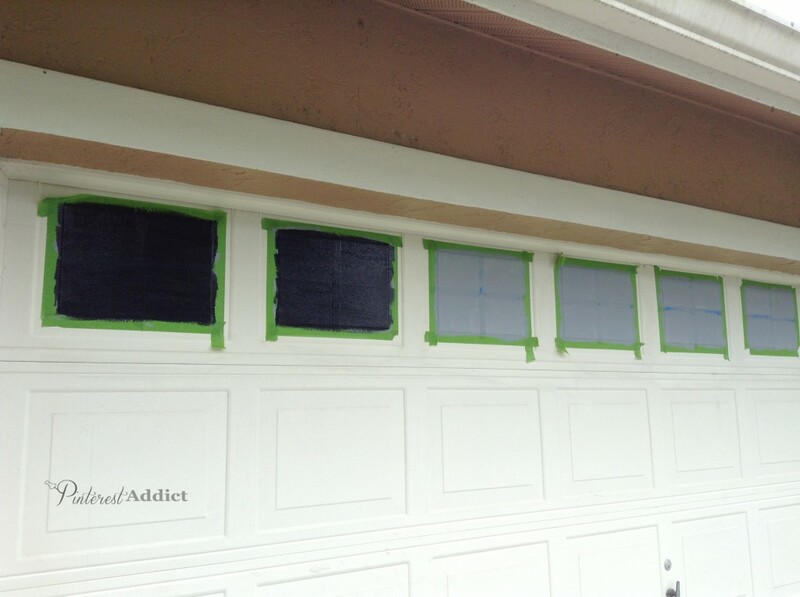 I’m installing three new Craigslist acquired single garage doors tomorrow, and will set my 13 year old daughter loose with frog tape and you in iPad form as her guide on our next cloudy day. Thought I might have her try white primer rather than gray in case ours bleeds a bit too (?). Anyone tried that since 2013? 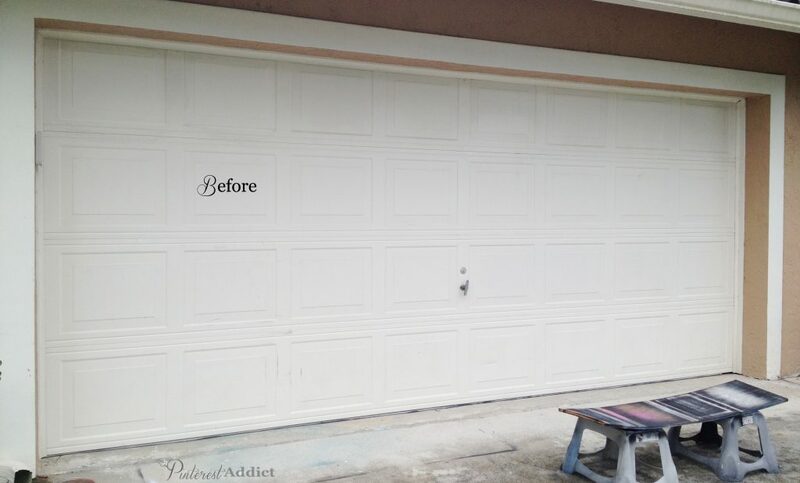 I am going to paint my garage door white and do the same thing! Thank you!! !